Which version of SharePoint am I using? When looking for help online, you often need to know the version of SharePoint you're using. This topic can help you find that out. If you got here from another topic, after you find which version of SharePoint you're using, click the previous button in your browser to return to that topic. While SharePoint does not have a version button or about box with version info, there are a few distinctive features on each version. Unfortunately you won't always see these features if an administrator and site designer has heavily customized the site. If you don't see anything here that looks familiar, ask your manager, administrator, or IT department. If you do see something that looks like your SharePoint environment, click the details below it for more information about that version. SharePoint Online provides several types of sites you can create from the home page. Here are some of the site types, and how to identify them. There is no ribbon and there is an app launcher icon. At the top of the page is Create site and Create News post. The body typically shows News from sites and Frequent sites. 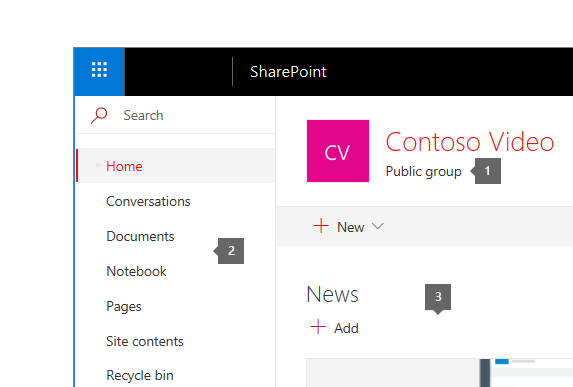 From the SharePoint Online home screen, you can create Team sites or Communication sites. Here's how to identify them. A Team site is connected to an Office 365 Group. For more on that, see What is a SharePoint Team site. There is a subtitle for Group. There is a left nav bar (Quick Launch), but no top nav bar. The body shows News, Quick links, Activity, and Documents. A communication site isn't connected with a group, though you can use groups for permissions. 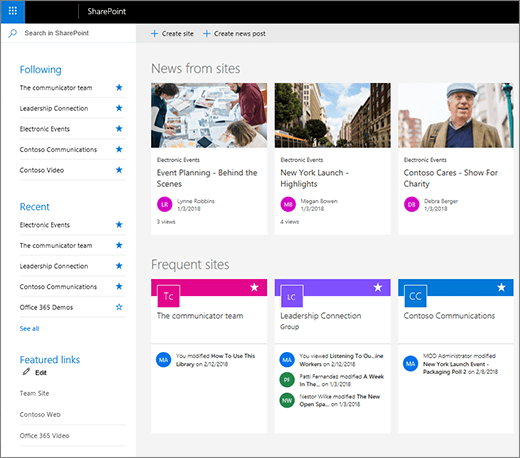 For more info, see What is a SharePoint communication site. There is a top nav bar, but no left nav (or Quick Launch) bar. There is only the title, no subtite for group declaration. The home page typically has News, Events, Documents, and Comments. Title of app is SharePoint. There is a ribbon. You're using SharePoint Online Classic experience. SharePoint Online is updated frequently, so Office 365 or SharePoint Online standalone will typically be the latest version. Note: While SharePoint Online is constantly updated, sometimes older sites will still appear in classic appearance. 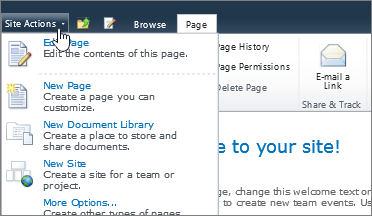 The main SharePoint Online home page show's a left nav with Following, Recent, and Featured links. On the top of the page there's a +Create site and +Create news post links. When you click +Create site you have the choice of a Team site or a Communication site. 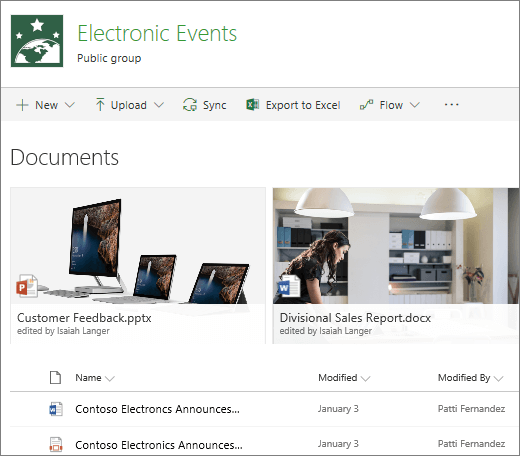 A SharePoint Team site will show the title with "public group" as a subtitle. It has a left nav bar, but no top nav bar. In it's default form, the body of the home page has News, Quick links, Activity, Documents, and Comments. 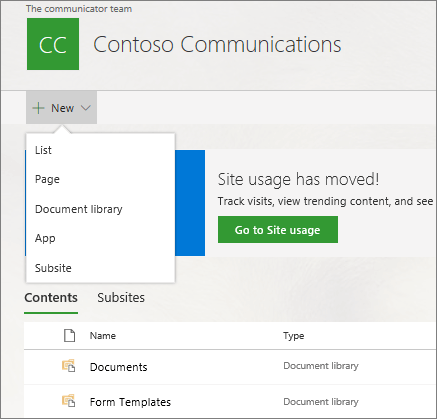 The SharePoint Communication site shows the title without a group subtitle. It has a top nav bar, but no left nav bar. In it's default form, the main body of the page show's News, Events, Documents, and Comments. When you click Settings , both site types show a drop down with a Site information choice along with other choices, but no Site settings choice. FromSite information you can change the title, logo, or description of the site, if you have the correct permissions. The redesigned SharePoint Home page displays frequently visited sites, the latest activity, followed sites, and recommended sites. There is also no ribbon. The Site contents page has also been updated. You can now add a list, page, document library, app, or subsite, right from the first level menus. 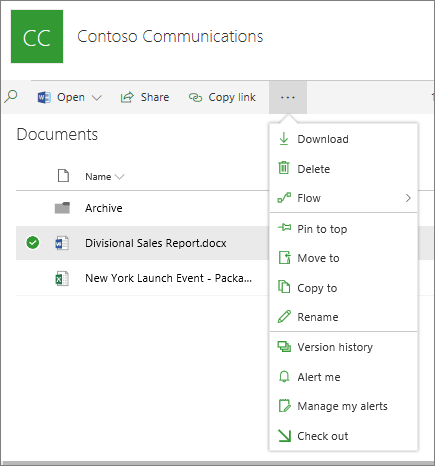 Document libraries offer list or tile views, with the ability to pin files, images, videos, audio, or whatever you want at your fingertips at the top of the page. Document libraries let you move or copy files between folders in the library with Move To and Copy To. 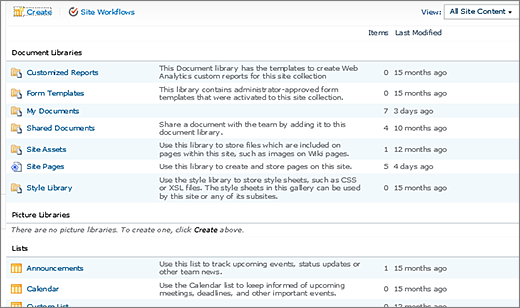 Lists are also updated with a new look, and through the SharePoint Online user interface, there is no ribbon. Click Open the details pane to see context sensitive information on the list, library, or individual files. In a document library, you can view file activity. 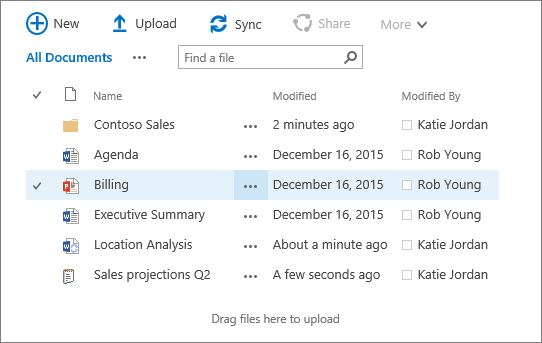 Select a file and view or edit properties, such as the name, title, or who has access. The command bar above library shows ellipses (...) that you can click for more options. Commands can appear on the Command bar when in full screen mode, or on the ellipses menu when in a reduced size. The Command bar options also change when you have items selected. Your administrator can choose to present a SharePoint Online site in the classic experience rather than the default look. SharePoint Online classic experience andSharePoint Server 2016 are very similar. However, there are two easy to spot exceptions, all in the upper left corner of the screen. Title of environment is Office 365. Title of app is SharePoint. Title of environment is SharePoint. Title of app is Sites. This title also appears on the app launcher like this. If you're using the SharePoint Online Classic experience, you can use most Help topics specified for SharePoint 2016. Title of app is Sites. This title also appears on the app launcher like this. There is a ribbon. There's a ribbon but no app launcher*, and only "SharePoint on the title bar. To switch between apps, there is a top menu bar. The Site Actions button is used to get to all SharePoint 2010's settings. Home is a button rather than a link. The Quick Launch bar is preset with Libraries, Lists, and Discussions. Note: One possible problem with the descriptions on these pages is if your version of SharePoint has been customized by your admin or site management. SharePoint is extremely configurable, and your admin can change or modify almost every aspect of what a site looks like and the options you have. If your site doesn't fit into any of these guides, you may need to ask your admin or site manager. Here some visual clues to identify SharePoint 2016. 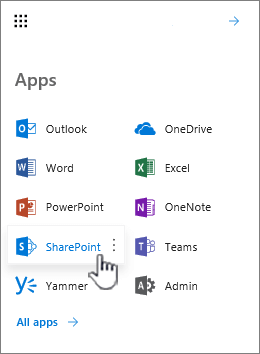 SharePoint 2016 was the first version of SharePoint to use the app launcher icon. 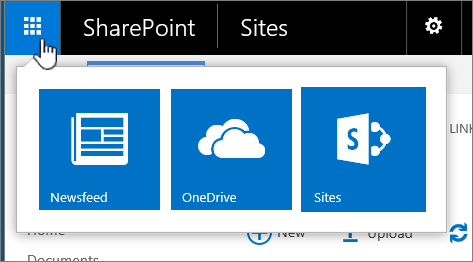 SharePoint 2016 shares this with SharePoint Online, and is where you can start SharePoint, OneDrive, the NewsFeed, or other apps depending on how your admin has configured it. The Settings button in SharePoint 2016 is on the left of your login ID and Help icon (? ), where SharePoint 2013 is on the right of your login. The Settings button shares the line with the app launcher, the environment name, and the app title is on the title bar. There is a command bar in SharePoint 2016 document libraries. It lets you create a New document, Upload, Sync, and do other library tasks. The items that don't fit on the command line are listed under the More command. The commands on the command bar change whether you're looking at a list or document library. For a list, only two options are offered, New and Edit, so it looks different. Views are just listed just under the command bar. Click the ellipses (...) for a drop down menu to modify or create a view. 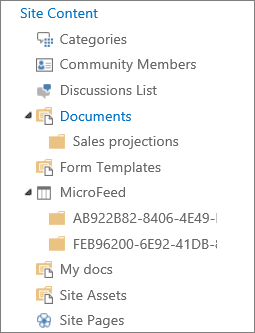 SharePoint Server 2013 has a ribbon with buttons to launch tasks. The difference between this and SharePoint 2016 is that there is no app launcher icon. The menu bar for SharePoint, NewsFeeds or Yammer, and OneDrive (or SkyDrive) is on the top right. If there are additional apps installed, they can appear as well. The SharePoint 2013 settings button is on the top link bar, on the right of your login ID. This differs from SharePoint 2016 which is on the left of your login ID. SharePoint Server 2010 is fairly different from the later versions of SharePoint. There is no Settings button, but a Site Actions button in the upper left of the screen. When you click Site Actions , you can get options to create new pages, sites, document libraries, view and update permissions, and get to all site settings and content. The Quick Launch bar on the left of the page, spells out libraries, lists, and discussions as headings. You can also open the Recycle Bin or view all site content. When you click All Site Content, you get a list of elements that your site contains, including a description and the last time modified. Navigating SharePoint Online, SharePoint Server, and Office 365 sites use several methods. Here's information about them. The Quick Launch bar is a pane that appears on the left side of the screen where you can go directly to pages, libraries and other areas of your site. You can add lists and libraries to be displayed there, as well as pages, subsites, Wikis, and other areas of your SharePoint site. The Quick Launch bar is a constant navigation method that appears in all versions of SharePoint, although the look and content changes between versions. You can add almost any element of your SharePoint site to the Quick Launch bar through the settings. 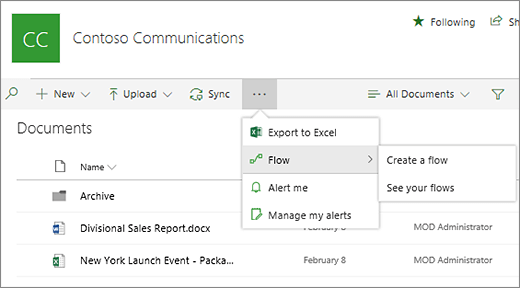 For lists and libraries, use the list settings or library settings, and click List name, description and navigation or Library name, description and navigation and look for Display this document library on the Quick Launch? 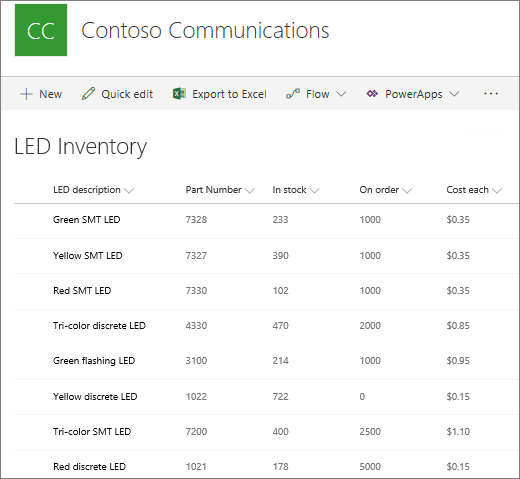 For more on editing the Quick Launch bar, see Customize the navigation on your team site. You can also display the Quick Launch as a tree view. For more information on that, see Display the Tree View in the Quick Launch bar. The app launcher is a grid type icon that opens a thumbnail menu of your apps. The app launcher is in the upper left corner of SharePoint Online, Office 365, and SharePoint 2016. As of July 2016, the App Launcher is available for administrators to deploy on SharePoint Server 2013 Hybrid installations. Depending on the apps you have installed or subscribed to, the menu of apps can vary. 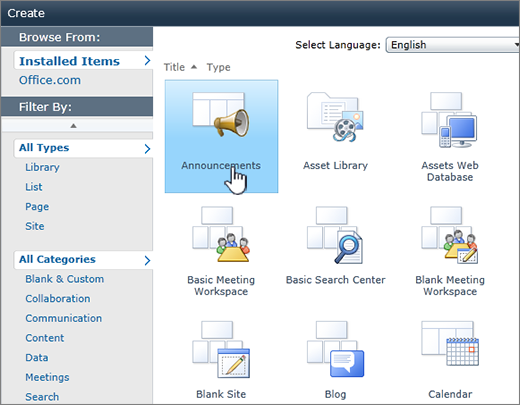 SharePoint can be customized to the point that it no longer looks like the examples shown here. When heavily customized, it's difficult to determine the version. Here another way to figure out which version you have. Using Help to help From the SharePoint home page, press the Help ? button. This brings up a Help pane for the version. The one exception is SharePoint Online, which brings up a standard webpage. SharePoint server products each have their own Help pane and page that identifies which version it came from.